I’ve been a bad, bad girl. Sometimes you just have to do what feels right even when The Law says otherwise. And sometimes you just have to do what feels right even if that involves a culpable level of premeditation and intent. This lovely place is the scene of the crime, the idea for which came to me last night when I was writing yesterday’s belated blog entry. The more I thought about Reggie and his dogged zeal, I realized what’s been missing from my more humane approach. I’ve been following the rules, staying on leash, and being an overall good girl. Whoever trained me trained me well…too well. And right now all the treats and patting and praising aren’t going to make up for the fact that I’ve been living a life that’s far too obedient and docile. Heck, even Lassie got to run around off-leash and kick up her furry heels every now and again: why shouldn’t I allow myself a similar stint of free heedlessness? 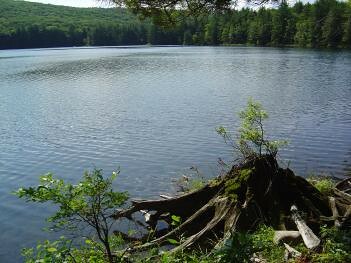 Dogs are allowed at Goose Pond, fishing is allowed at Goose Pond, and even mountain bikers are allowed at Goose Pond. But, for some reason, swimming is Not Allowed: why should that be? If Goose Pond were a source of drinking water for the community, it would make sense to keep swimmers from contaminating its water…but if that were the case, dogs would be disallowed, too. If Goose Pond were already polluted, a toxic site from some long-forgotten industrial runoff, it would make sense to protect swimmers from chemical exposure…but if Goose Pond were contaminated, fishing would be dangerous, too. And if swimming were an erosive danger to the delicate shoreline of Goose Pond, even I would refrain from dabbling even a toe into its crystal waters…but if the city is concerned about erosion, why do they allow mountain bikes to scar its trails? In a word, there is no good reason to prohibit swimming at Goose Pond, but I suppose there are plenty of legalistic ones. If the City allowed swimming at Goose Pond, they and their insurance company would be responsible for any subsequent injuries. Rather than facing the lawsuits and bad press that would flourish in the aftermath of any natatorial mishaps, the City chose to take the safe way out: outlaw swimming in order to protect citizens from themselves and the presumed dangers of the deep. 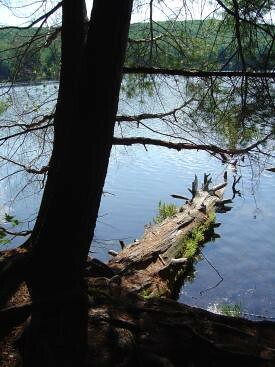 After all, Goose Pond looks like a mighty dangerous place, don’t you think? And this wild-and-crazy 35-year-old college professor just might get completely out of hand if she were legally allowed to swim there: just imagine the carnage and disaster that would ensue if The Law weren’t there to protect her from her own aquatic tendencies? With echoes of Henry David Thoreau’s “Civil Disobedience” ringing in my mind, this morning I drove with the dog to Goose Pond, swimsuit under my shorts and T-shirt, fully intending to break the law. Thoreau, of course, recognized that unjust laws exist and that it might take a lifetime to retool the machinery of an unjust or simply inept government. 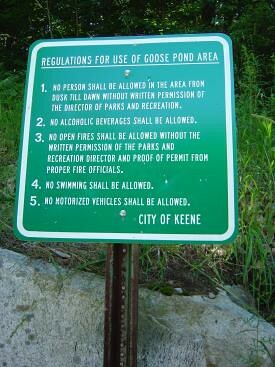 Given these facts, Thoreau argued that transgressing an unjust law is one way to “Let your life be a counter-friction to stop the machine.” Perhaps someday the City of Keene will change the rules governing the use of Goose Pond…but in the meantime, time’s a-wastin’. Rather than waiting for a new sign with new rules, this morning I did my part to make some friction. Goose Pond actually looks a bit like Thoreau’s own Walden Pond, and given that Thoreau’s mother was born in Keene and he visited the town at least once during an expedition to Canada, it’s even possible that Thoreau himself visited Goose Pond. 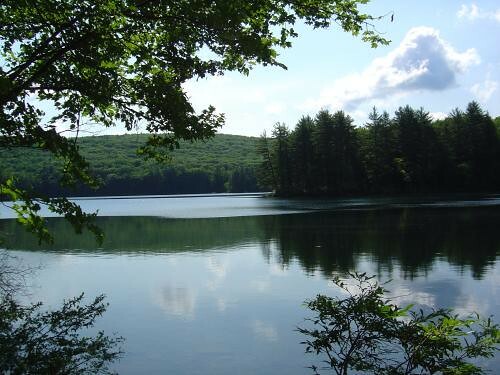 Such speculations aside, though, Goose Pond is about the same size as Walden Pond and equally lovely, but on even the hottest day, Goose Pond is never nearly as crowded as Walden, which serves as a popular and officially sanctioned local swimming hole. So perhaps that sign decreeing that No Swimming Shall Be Allowed at Goose Pond is a blessing in disguise: as things stand, only diehard rule-breakers like myself have the nerve to sample Goose Pond’s tranquil waters, a well-kept secret that promises to remain well-kept. Why, you might ask, did I feel the need to violate the law in such a flagrant fashion? Why go swimming at all today, and why choose to swim at Goose Pond when there are other local places where swimming is allowed? 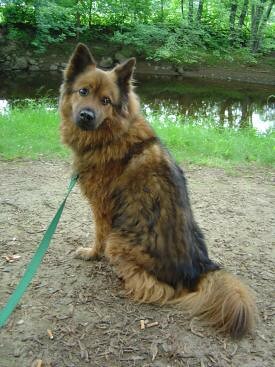 After watching Reg relish his off-leash excursion into the Ashuelot River the other day, I remembered that in years past (when we lived in Massachusetts at least) I’d go several times each summer to Walden Pond, where I’d swim off a secluded corner of shoreline away from the officially sanctioned beach. In those days, summer wasn’t summer until I’d gone swimming, and swimming at a beach or pool just didn’t cut it: it had to be Walden Pond, and it had to be on one of Walden’s isolated shores, somewhere were you weren’t exactly supposed to swim. And so today, Goose Pond served as my Walden. The place where I swam was on the shady backside of a piny peninsula; only a narrow dirt path led down to a hard-bottomed shore. As the dog looked on in utter amazement, this being the first time I’ve gone swimming with him, I quietly, slowly floated out about 10 yards from shore: far enough to feel afloat in the middle of what Thoreau termed earth’s eye but close enough to keep near Reg with his fear of deep water. 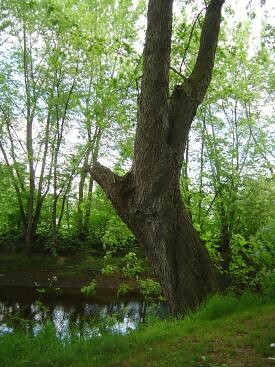 Today’s swim wasn’t long but it certainly was good: after about 10 minutes of cruising the piney shoreline, I returned to that dirt path where I stretched out on the earth, my T-shirt and fleece sweater spread on the ground like a blanket. As Reg investigated the nearby undergrowth, I let the sun dry my skin as red-eyed vireos, black-throated green warblers, and eastern wood pewees sang from the trees overhead, the air zipping with dragonflies. It might have been a crime, this brief dip in Goose Pond, but it sure felt good. Summer isn’t summer until you’ve celebrated your own private rituals of initiation, and sometimes secret sin is just the ticket to easing into the season. After toasting in the morning sun for 20 minutes or so, I shook off that T-shirt and fleece, clambered back into hiking shorts, and headed back around the pond. Today was beautiful, you see, and to have resisted such a siren lure would have been criminal. This morning I mailed off the last of four batches of spring/summer semester grades: the end of an era. Although I’ll be teaching one more online class starting Monday, I have the rest of the summer off from face-to-face teaching. This marks, then, the first time I’ve really had the time to settle into my status as a newly minted Doctor, the first time I’ve really had the time to face the daunting question of “what’s next.” For ten years, you see, I’ve been on an over-worked, under-rested version of auto-pilot. Whenever the question of “what next?” arose, there was a tangible work-related answer close at hand: next I need to grade this stack of papers, next I need to revise that diss chapter, etc. At this juncture in my life, “what’s next” raises all sorts of thorny questions, most of which I’ve ignored for a decade (yes, ten full years) while I was working on the doctorate. “What’s next” raises the question of whether or not I want to go on the drum-tight academic job market: even if I could, through some Cosmic Miracle, manage to land a tenure-track job somewhere, do I want to sign onto a rest-of-my-life commitment to teaching and the publish-or-perish expectations of academia? Ten years after starting my PhD program with starry-eyed visions of what it meant to be a college prof, I’m no longer sure what I want. I like teaching; most of the time, I love it. But after ten years of teaching way too many students at way too many colleges, I’m wondering if I’ve continued with teaching because it’s what I’m called to do or simply because I don’t know what else to do. There’s a big difference between actively choosing a career path and passively acquiescing to whatever path the Fates nudge you toward, and it feels like I’ve spent the past ten years acquiescing. Most of all, I’m simply tired. Ten years is a long time to juggle studies, teaching, and some semblance of a life; ten years is a long time in general. Looking back from the mountain top, it feels like I’ve been holding my breath for ten whole years, putting off health, sanity, and joy for “later, after I’m finished with the PhD.” Every undergraduate has memories of the body-breaking all-nighters that mark semester’s-end, a ritual that 18- to 22-year-old-bodies rapidly bounce back from. But at 35 I’m feeling a bit less resilient: right now it feels like I’ve weathered a decade of all-nighters in a body that no longer wants to bounce. The short-term coping mechanisms that got me through my undergraduate years are fine and good, but after pushing the envelope for too long, I’ve taxed my body’s patience. If I simply had taken a cue from the dog all these years, maybe I wouldn’t now be feeling so drained. As soon as I unclipped his leash, Reggie made a beeline through the underbrush down to the river; before I could call him back, he was in the middle of that river, swimming. Dogs have no concept of delayed gratification; dogs don’t know how to put off health, sanity, and joy for “later, after I’m finished.” Dogs know that play is essential and frequent naps even more so; dogs know that work is something to be done whole-heartedly and then shaken off with similar vigor. Dogs know that dissertations are merely piles of boring-smelling paper and that doctors walk no better nor any farther than non-docs. Even Zen Mamas can learn a new trick or two from an old dog who, despite creaky hips and steep river banks, will dive into water first and try to figure out an escape route later. Steep banks, muddy water, and thorny underbrush be damned: Reggie has never found himself in a fix that couldn’t be remedied by a hardy shake and a good long nap. As for me, I’ll stay on land and out of the underbrush: perhaps a couple months of dog-like catnapping is just what Dr. Reggie ordered. There are multiple miracles depicted in this photo. If you believe that birth is a miracle, there are two miracles growing in the bellies of my friends Jen (center) and Stella (far right). The fact that Jen and Stella, themselves born on the same day, just happened to get pregnant at the same time, are due on the same day, and have a due-date within a week of the birthday of another of my friends in this picture, Ji Hyang Sunim (far left), is also pretty miraculous. To see six Zen Center women, five of them from my heyday as a Zen Center resident, in a single photo is pretty miraculous: going left to right across the front row, Ji Hyang, myself, Jen, Miranda, and Stella all lived together at the Cambridge Zen Center between 1995 and 1998, and yesterday we found ourselves together again. In the second row in the picture is Cathy, who moved into the Zen Center after I’d moved out: she represents the next generation of Zen Center women, a fresh start for the Dharma. Babies and baby showers, of course, represent the ultimate sort of fresh start. Considering the prospect of bringing a new life into the world, parents (especially first-time parents) invariably think about reforming their lives: now that someone else is relying upon them, they’ll take better care of their health, their finances, their home. The jalopy that was fine for single and child-free married life will be replaced with a safer, more sensible vehicle. Beer money will be funneled into an indispensible Diaper Fund. And inveterate night owls and party animals will find themselves transformed into another kind of creature: bleary-eyed parents. Babies represent the ultimate fresh start for humanity: outside of this secluded garden, the world goes on with its warring ways, but Baby will be rightfully sheltered from those realities as long as is humanly possible. One of the women at yesterday’s double baby shower referred to the tribal nature of the event: how very primitive it seems for all the women in a local “tribe” to come together to make sure a mother-to-be has all the supplies, know-how, and moral support she needs. Yesterday’s tribe was a far-flung bunch: I drove to Massachusetts from New Hampshire, Stella’s sister came from New York, and a handful of well-wishers, including one 3-month-old fellow who was eagerly welcomed into the all-female crowd, hail from Korea. Herself Korean, Stella remarked how her family didn’t have this tradition of a “baby shower”: her husband, Won-tak, in fact, was particularly flummoxed by the women-only aspect of the event. “What sort of party is this that no men are invited?” he asked. “It’s a party for the baby!” Stella replied. “But the baby isn’t here yet,” Won-tak countered, still confounded by this strange and unusual phenomenon. Both Jen and Stella are first-time moms, so one important aspect of yesterday’s shower was the transmission of the complicated lore of babies and baby-dom. “What’s a receiving blanket,” someone asked, and someone answered. “What is this?” Stella asked upon opening a box of Dreft. “It’s special detergent for the baby’s laundry,” her older and wiser (at least in the lore of baby-dom) sister-in-law answered. “Everything the baby wears or comes into contact with needs to be washed in a gentle detergent, in case the baby has allergies or sensitivities.” Stella’s expression was simultaneously grateful and a bit overwhelmed. “I need baby detergent?” she said. Luckily humans are adaptable and quick-to-learn; by shower’s end, both moms-to-be could articulately explain to their childless peers the merits of hooded baby towels. Like any tribal ritual, baby showers exist to pass along the traditions and values of a particular community: here is what we value, what we believe, what we share. In my mind, the most miraculous moment of yesterday’s shower was when my friend Ji Hyang, a Buddhist nun who is notorious for her aversion to having her picture taken, rushed to be in that group photo: she even removed her ubiquitous hat. Ji Hyang and I might be childless by choice, but we know full well the value of babies and baby-dom. Babies are a fresh-start and so is friendship: reuniting with housemates from years past is its own sort of miracle, a chance to redeem time by returning to the best of our own human nature. Child-bearing or childless by choice, we humans are tribal by nature: it’s something passed down from generation to generation, from culture to culture, stamped into our cells like genes. Circled around the life-fire of an infant or two, in the presence of friends old and new, we find our faith in humanity and humanity’s world restored. Tomorrow morning grades are due, so today I’m wrapping up some grading loose ends. The end of the semester is always a time to sort through things left undone during the weeks preceding the end-of-term. Teaching (especially adjunct teaching at several institutions) inevitably involves a certain degree of triage: there’s always something due or overdue, so you dedicate yourself to the most direly burning emergency. After grades are due, you step back, sort through your pile of “to-do laters,” and play catch-up. This cyclic sort of work load is something that the friends, family, and especially partners of academics have to adapt to. When it’s “that time of the semester,” your Beloved Professor is going to be up to her over-educated nostrils in grading and other demands, so she’ll fluctuate wildly between manic periods of work and depressive periods of procrastination. By hook or by crook, though, when grades are due, they will be delivered, a nap will be had, and dusty pleasure-reads and old forgotten friends will be re-visited. When I was an undergraduate, I had a ritual to mark the end of each semester. During Finals Week, which my roommates and I dubbed Be Bad to Your Body Week, I was allowed to eat any sort of comfort food. Late- and all-nighters required bushels of Doritos and gallons of Mountain Dew. Hard work would be rewarded with study breaks featuring my favored gustatory guilty pleasure: Graham crackers slathered with canned chocolate frosting. Bags of M&Ms (a.k.a. “Happy Pills”) were at-the-ready for moments of despair, stints of exhaustion, and any sort of emotional emergency. By the time I’d finished my last exam and submitted my final paper, I felt entirely toxic, gleefully ready to go home and eat some semblance of a normal diet. But before I went home where I’d invariably spend the next several days in a coma-like slumber on my parent’s living room loveseat, I’d clean my desk. See, I tend to cycle between neat-freakdom and utter slovenliness, and my desk is usually the ultimate statement of where on the cycle I currently happen to stand. If my desk is clean, I’m in a calm and ordered state of mind: I have adequate time to devote to work, play, and all sorts of activities in between. If my desk looks like a federally declared Disaster Area, I’m feeling overwhelmed by work and other obligations. I’m probably neglecting my health, I’m probably neglecting play, and I’m probably feeling entirely rotten because of both. Since I tend to be a Piler (my personal motto being “A pile for everything, and everything in its pile”), semester’s-end was when I’d sort through piles, saving whatever needed saving and throwing out the rest. This act of discarding items that seemed Positively Essential three weeks previous but had proven to be Largely Ignorable in the meantime was always immensely therapeutic. Had I been able to light a massive bonfire in or around my dorm room, I would have burned those papers; instead, I allowed myself the oddly cathartic pleasure of ripping them (by hand) to shreds before relinquishing them to the trash basket. Now that I teach, I have to be more careful about discarding the Piles of the Past. Profs are usually required to keep unretrieved student papers for a full year before discarding them; privacy issues prohibit the once-common practice of setting out a box of graded papers for eventual student pick-up. These days I try to recycle the papers that I do (eventually) discard: this means sifting through student portfolios to remove paper-clips, report covers, and other office-supply reusables and then sending the rest to the departmental recycling bin. Here at home, though, the task is even more daunting. After 10 years of PhD studies, I have piles and files of research articles and other paperwork that begs my attention; in one closet, I have a huge box of semi-sorted utility bills, check-stubs, and other bookkeeping items that I’d intended to organize when we lived in Hillsborough. (As pathetic as it sounds, it’s true: when we sold our house and moved to Keene, I simple transfered The Pile to a box that’s been sitting in a closet ever since.) Now that the dissertation is complete and the doctorate is in hand, I need to revisit these and other piles, sifting, sorting, and shredding. It’s a bit like archaeology, this re-visiting of the Piles of the Past, and it’s a bit like therapy, too: a process of examining and re-assessing the dusty, almost-forgotten leftovers of what once seemed essential. Right now, though, the Pile that awaits me is a Present one, the stack of papers I need to grade by tomorrow’s deadline. Once those grades are completed and delivered, I’ll take nap and possibly crack open a can of chocolate frosting. There are some habits, you see, that I can’t possibly discard. 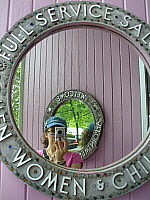 For you fans of reflective photography, I’ve posted three new pictures to the Mirror Project. Enjoy! This is the facade of the Historical Society of Cheshire County on Main Street: another example of the Italianate style of architecture I’d mentioned last weekend. I’m posting this picture to give you a sense of the kind of brightly lit photos I can take with my new pencam. Although I still take most of my blog photos with my digital camera, I bought the pencam so I could take quick pictures in situations where I wanted to be more discreet or in places where I didn’t want to carry (and potentially damage) my more expensive camera. 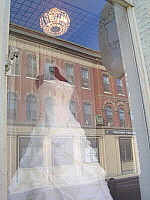 In brightly lit settings, the pencam works remarkably well, as you can see by perusing all seven pictures in this post. And since I’ve already dropped the pencam several times with no apparent ill effect–and since it’s so easy to slip into a pocket, carry in a hand, and use unobtrusively–it really is a great alternative for times when I’m rushing around and don’t want to carry and coddle my full-size, delicate, full-price camera. The pencam beeps when you snap a photo, so it’s still difficult to be entirely surreptitious. But since most folks carry beepers, cell phones, and the like, a little beep here and there isn’t necessarily going to alarm the locals. In low-light settings, though, the pencam doesn’t perform very well, as this picture from last night demonstrates. Chris, Kathleen, and I went out for Mexican food before going to see a late showing of Fahrenheit 9/11. (Thanks to Kathleen’s mom for ordering our movie tickets online after we arrived early at the theatre to find a huge line snaked outside.) In the process of showing Kathleen my new toy, I aimed it at Chris, who promptly flipped me off. So now all of cyberspace can revel in Chris’s spontaneous expression of One Finger Zen. In the interest of fairness, I should admit that Chris used to display in his corporate office cubicle a photo of me flipping off a photographer with both hands: when co-workers asked about this illustration of Two Finger Zen, Chris would remark, “That’s my wife; isn’t she lovely?” Alas, when provoked, I can act as low-life as anyone. When I ordered the pencam, I knew that it tended to give low-light photos a blurry orangish tint: after all, I’d first considered getting a pencam after seeing Ron Cillizza post similarly surreptitious restaurant pictures. Sometimes you want photos that are crisp and clear; other times, though, you’re content to capture a blurry glimpse of a dimly lit moment. Ron’s photos from the 99 Restaurant captured a mood of smoky, beer-addled idleness: whether or not that’s what the scene actually looked like, the images nevertheless suggest a seamy mood. Last night’s mixed-company version of the usual beer and burritos ritual wasn’t nearly as trashy as Kathleen’s pre-game hype would have suggested, but the dark, grainy pictures make it seem so. The folks at the next table had an expensive digital camera, and they insisted on taking a series of obnoxiously obtrusive pictures of one another and the waiter. Their full-flash photos probably came out bright and clear, but no one around our table knew that I too was armed, albeit with a much smaller device. And on the way home when Kathleen was pulled over for an entirely different kind of low-light–a burnt-out rear license-plate bulb–the baby-faced officer peered suspiciously into the car to see if we’d been drinking, but he didn’t search for cameras. Unlike the movie security guard who gave my shoulder bag a good strong stare as we entered the theatre, the traffic cop had no clue I was digitally armed and watching. Had I had that pencam at the ready, you see, I could have secretly snapped every moment of his spot-lit interrogation. As it was, our low-life transpired in low-light, so you’ll just have to believe these admittedly blurry and dim-lit details. These days the Northern Catalpa trees (Catalpa speciosa) are in full bloom. 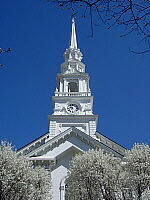 Catalpas are planted ornamentally throughout Keene. 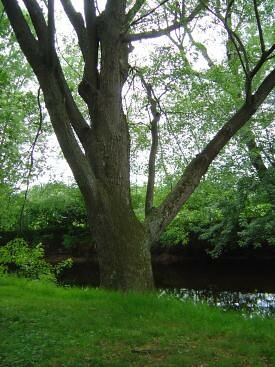 They have large, heart-shaped leaves and wide-branching crowns, so they make lovely shade trees. And when they bloom, you can see their massy clumps of white flowers from far away: they look like giant, green-and-white bouquets. This picture is a close-up I snapped on my way home from school the other day: this is someone’s front yard tree, and one particular bough reached down near the sidewalk for the perfect photo opportunity. Yesterday I taught my final face-to-face class of the summer, so I’ll spend the rest of the weekend grading. But even when you’re buried in papers, it doesn’t take long to stop and contemplate the catalpas. Thank goodness it’s Friday, and thank goodness we have catalpas to help us carry on. I think I might have missed my calling: instead of being an English prof, I should have become a private eye. These days as I stroll the streets of Keene snapping random pictures of house facades and other residential minutia, I feel sneaky and even subversive. Surely there must be something wrong with someone who goes around taking secret shots of ordinary objects and then posting them for all of cyberspace to see. Standing outside a local bank the other day taking pictures of the brickwork surrounding its flagpole, I felt as if black-suited men might approach at any moment: “Excuse me, ma’am, but what do you think you’re doing?” At times, my blog-snooping feels like I’m casing out the joint–many joints, in fact–as if I’m searching the city for its soft hidden underbelly where I might crawl in for some nefarious attack. What I’m actually doing, of course, is far less exciting. I’m not subversive…I’m merely curious. While I was viewing the current exhibit of restored photos of Keene’s architectural heritage that I’ve previously mentioned , for instance, I was intrigued to note that one local shopping mall used to be a brickmill. 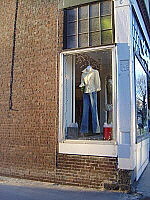 I had known that many mills and factories existed along the railroad track that used to run through town, and I’d figured this particular shopping mall used to be some sort of mill, but I didn’t know they made bricks. “Interesting,” I thought as I studied the photo. “Maybe that explains why there are so many brick buildings in town!” Walking home with thoughts of brickmills in my head, I was started to find what apparently are Keene-made bricks surrounding the flagpole at a local bank. Now, why hadn’t I noticed those before? For good or ill, I’m the sort of person who’s curious about just about everything. I like mundane mysteries of just about any stripe: what sort of flower is that growing in the neighbor’s yard? Where did that newly planted tree come from? What did that abandoned factory manufacture, and how did it come to be abandoned? So when I see a ring of Keene bricks circling a local flagpole, a torrent of questions appears: when were those bricks manufactured? When were they set around this particular flagpole? Are there other places around town where this type of brick are similarly visible? How widely were these bricks distributed, and are there other towns along the old railroad route where Keene bricks might also be found? Suddenly the simple act of stopping at a flagpole and looking down turns into a major potential research project: surely there must be more information about this brickmill in local archives. When did it go out of business? Why did it go out of business? Who worked there, and what did they do after the mill closed? Further afield, would it be possible to track the geographical distribution of Keene bricks by enlisting other curious folks across the country to scavenge their own towns for similar artifacts? I suspect (or perhaps hope) that other people aren’t like this: I suspect (or at least hope) that other folks simply walk into the local bank, conduct their business, and go home. Other folks, I surmise, walk around town without seeing questions in every tree, house facade, or sidewalk railing: what is that, when was it build, why was it constructed in that precise fashion? Other people, in a word, have lives: they aren’t haunted by mysteries and questions, and they don’t delight in looking for even more mysteries and questions. Other folks–folks who are normal, that is–simply live their lives with no questions asked: their lives are about what’s, not why’s. I assume that other people aren’t with laden my brand of curiosity because none (or very few) of them act the way I do. 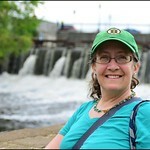 I don’t see other folks walking around Keene taking pictures; on that architectural heritage tour, I was the only one taking thorough notes and pictures, somehow miraculously juggling notebook, pen, camera, and a intermittently necessary umbrella. Other people don’t take a pencam to the grocery store or take pictures in the parking lot…or at least if they do, they do it far more discreetly than I. Although it hasn’t yet happened, I keep expecting for someone to accost me during one of my photo-snapping jaunts. “Hey, you! You with the camera! What the hell do you think you’re doing?” And what the hell, indeed, do I think I’m doing? On that walking tour, one curious man tried a more polite level of interrogation, and my answers left him stumped. “Are you an architecture student,” he asked. “No, not hardly,” I chuckled, still scribbling notes. Later in the tour I came clean with this still-mystified gentleman. “I’m a professor…I teach at the college…I specialize in 19th century American literature, so I like to learn about the historical and social contexts of the works I study.” The man nodded, intrigued. “As an Americanist, you see, I need to know a little bit about all sorts of things: American history, art, music, architecture…” And all this is true: in order to understand any literary text, it helps if you understand the cultural context in which that text was created. What I find most curious, though, is that I feel this need to explain and even justify my own curiosity: why must one be a professor to be fascinated with mundane mysteries of just about any stripe? Why is curiosity the exception rather than the rule? Why aren’t there more people walking about with cameras and notebooks and open eyes: why aren’t there people across the country investigating bricks and their particular manufacture? Like it or not, we snoops are an odd and rare bunch; our cameras and peering eyes cause others to raise an eyebrow or scratch their head. The fact that I’ve never been angrily accused of “suspicious behavior” depends largely, I’m sure, on the fact that I’m a white woman and thus (presumably) nonthreatening as walk about town with a frisky dog. If my personal particulars were different, though–if I were male, for instance, or black, or if I looked even remotely Middle Eastern–then surely my snoopings would be received differently. Recently Ron Cillizza posted a link to a Village Voice article about a proposed law that would ban photoblogging on New York City subways. In this post-9/11 world, curiosity isn’t merely unusual, it’s presumably dangerous: instead of investigating bricks and building facades, apparently we all should be investigating one another. Am I the only one who finds something a bit curious about that?